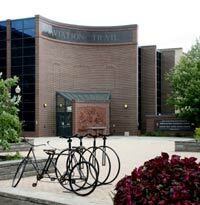 The Visitor Center serves as a central orientation site for the Dayton Aviation Trail. 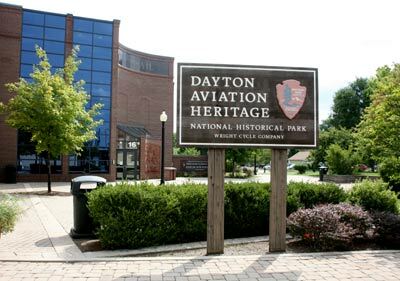 The Aviation Trail is a driving tour that highlights over 45 sites in the Dayton area that are all related to aviation history. The Visitor Center brings all of these diverse locations into a cohesive exhibit and how they all relate to one another and the birth of aviation in Dayton. What more fitting location for this Visitor Center than right next door to the only remaining Wright Bicycle Shop? 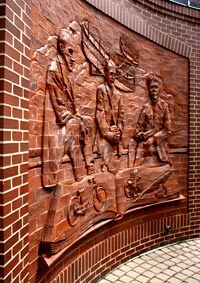 Outside of the Visitor Center you're greeted by a carved brick semi-circular wall that features the 3 main characters: Wilbur, Orville and Paul Laurence Dunbar. The Aviation Visitor Center's goal is to tell the historical story of the Wright brothers, but to also give the visitor a sense of the time and place that they lived. Paul Dunbar became one of America's great African-American writers, and his story is interlaced with Wilbur and Orville's story. The Center lets you discover through exhibits, documents and vignettes, every phase of the Wright's lives, from their early childhood, through their early careers as businessmen with their printing equipment, their bicycle business, and their pioneering study of aviation through scientific investigation and experimentation. The Aviation Trail Visitor Center is the place to start on your tour of the birth of aviation and the lives of Wilbur and Orville Wright. Part of the Visitor Center also features the Parachute Museum, which introduces visitors to the history of the the parachute. The Aviation Trail Parachute Museum on the 2nd floor traces the history of the free-fall parachute from its invention in Dayton at McCook Field up to the parachutes on todays' spacecraft. The Wright brothers built their airplane in Dayton, and then disassembled it, got on A chesapeake and Ohio train They left from Cincinnati, and traveled to Old Point Comfort Virginia. From there they traveled south to Kitty Hawk on the Outer banks of North Carolina. On Wilbur's first trip to Kitty Hawk, he left on September 6. Took 2 different trains, a steamer, a small boat, and ramshackle schooner that barely survived a harrowing storm. He arrived almost a week later at which time he began assembling the plane parts, some of which he had carried the entire way. In the following years, Wilbur and Orville learned to make the trip in less time, but travel still took several days each way. The pioneering spirit ran throughout the Wright family's bloodlines. They were directly related to Margaret Van Cleve, the first woman settler to set foot in what would later become Dayton. Susan Koerner Wright's father came to America from Germany, married her mother, and moved to the western frontier in the 1830s. Likewise, Milton Wright's parents also moved west and carved a farm out of what was then the vast Indiana wilderness. Milton and Susan began raising their family in 1871. They had 7 children: a set of twins, Otis and Ida, died shortly after birth. Their son's Wilbur and Orville carried on the family's pioneering traditions.